Snapdragons that had to be cut back because they grew to much before heading into winter. A task normally not needed. I am suffering the consequences this fall of planting my Cool Flower seeds and transplants in the garden too early. It doesn’t really matter what drove me to break my own rules— and by the way, breaking the rules totally backfired, as rule breaking generally goes. What troubles you may be asking? Let me count the ways as I am currently recovering from one of the most frustrating! For easy finger pointing I’m going to just list them below as I have lived them out. My correct planting time for fall hardy annuals is early October. I planted in early September and have suffered because of it. Early October is the recommended 6-8 weeks before the first expected hard frost here in my zone 7 garden. One of the benefits and key ingredients of fall planting is the cooler temperatures, especially at night. This is not happening in early September here in southeastern Virginia. Hot days with warm nights does not make for happy cool-season hardy annuals. Read on for their revenge. A bed of Bells of Ireland that seeds were planted directly in the garden. There are many different stages of growth because the seeds struggled to sprout in the warm temperatures. Slow and spotty germination of the direct seeded flowers I planted. Guess what wasn’t slow and spotty to germinate? The weeds. So, while my flower seeds sat there and waited for “their” preferred cool conditions the weeds well, flourished. The Bells of Ireland began slowly sprouting a couple of weeks ago, but oh so poorly. However, the past few days temps dipped at night and we had rain and guess what? The Bells are popping; however, they are so many different sizes from tiny to big which makes hoeing those early weeds difficult at best. I just finished hand weeding three 80-foot rows. Something I haven’t done in years. 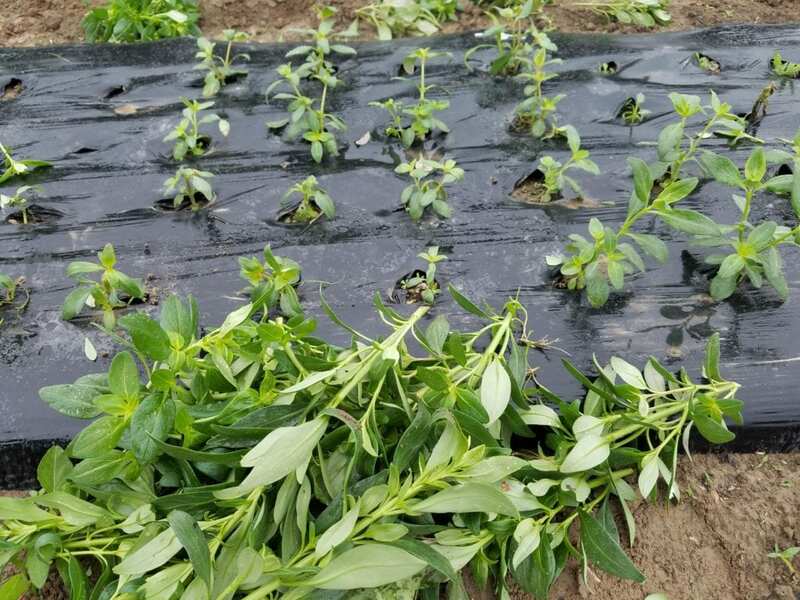 We plant transplants into biodegradable film for many reasons. 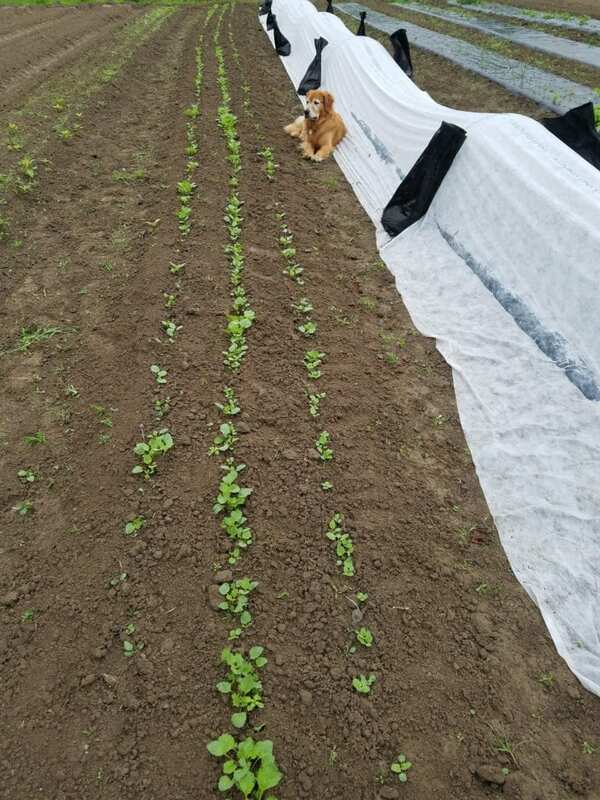 For fall plantings we use the black film because it helps to warm the soil through winter and spring. Well, when you plant too early and the daytimes temperatures are still occasionally heating up, it can toast transplants in one afternoon. It was to warm one afternoon and I toasted about half of our transplants. We have had a whole second round of seed starting to produce plugs to plant into the burnt-up transplants holes. A very sad state of affairs for the seed starter and the planter around here. Those transplants that survived the heat in the film are now growing way too big to go into winter. So, I just spent time cutting back all those plants. The stems now all lay in a pile. LZ’s old farmer rule: stick with the rules to succeed with the least amount of work. Learn more about when you should plant hardy annuals and more—All Things Cool Flowers. When you say 6-8 weeks before frost, is that for transplanting or seeding into mini-blocks? That is planting transplants or direct seeding in the garden. That timeframe allows transplants to become established or seeds to germinate and grow into a small plants. You have more wiggle room with transplants doing late planting. Throw some hoops and row cover and they do great. The best Amazon sweet Willy I’ve grown was mid December planted– tiny plants and they thrived to produce honker stems.